Pictured above: MBARI Scientist Yui Takeshita retrieves sample bags from his coral reef sampling station in the Great Barrier Reef. Coral reefs, sometimes referred to as the rainforests of the ocean, are among the most productive and biologically diverse ecosystems in the world. While only occupying about one percent of the ocean floor, it is estimated that they provide habitat for roughly a quarter of all known marine species. In addition to providing habitat for many marine organisms, coral reefs also form a base for, and help to stabilize, other ecosystems, such as seagrass beds that can grow around them. This makes coral reefs a crucial component of tropical marine ecosystems. Furthermore, they benefit society worldwide, providing food for millions of people and storm protection for coastal communities. They also offer opportunities as a source for discovering new medicines and generate billions of dollars in tourism revenue. The world ocean is warming and becoming more acidic, impacting the health of coral reefs. New tools are helping scientists learn how reefs recover—or not—after events that kill off large sections of coral. Cutting-edge chemical-analysis tools and techniques developed by MBARI Scientist Yui Takeshita are helping shed light on how coral reefs fare after severe damage from stressors like cyclones and bleaching (induced by warming/climate change). Takeshita and his collaborators have begun a systematic study of changes in one section of the Great Barrier Reef. Signs of coral recovery can be seen on top of dead, algae-covered corals. Photo by Yui Takeshita. Calcification—the process where the coral animals that make up the reef build their calcium carbonate skeletons—is at the heart of coral reef health. The base of coral reefs is formed by dead coral skeletons that have been growing for thousands of years. Live corals lay down new skeletons on top to create the complex three-dimensional structure of the reef, which is integral to the proper function of reef ecosystems. For example, the structure provides essential habitat for organisms, and protects other areas adjacent to the coast by dissipating storm and wave energy. Coral animals have an interesting, symbiotic partnership with a type of algae called zooxanthellae. These algae live inside of coral tissue and share their energy with the corals through photosynthesis and, in return, get a safe place to live and compounds needed for photosynthesis. In fact, the vibrant colors of the corals are from the pigments in the algae, not the corals themselves. The coral “hosts” use this algae-derived energy for processes such as growth, reproduction, and calcification. Without the energy provided by the algae, the corals starve and cannot survive for long. Sadly, coral reefs have been deteriorating worldwide due to human activity. It is estimated that about half of the reefs are damaged or severely damaged, and some scientists believe that up to 90 percent of coral reefs may die off by 2050. Sadly, coral reefs have been deteriorating worldwide due to human activity. It is estimated that about half of the reefs are damaged or severely damaged, and some scientists believe that up to 90 percent of coral reefs may die off by 2050. On local scales, overfishing, pollution, sedimentation, and agricultural runoff can rapidly degrade reefs. Outbreaks of crown-of-thorn starfish have also had devastating impacts on corals in recent years. In addition, global stressors such as rising ocean temperatures, sea level rise, and ocean acidification continue to threaten reefs, including in remote areas that are far from human civilization. In particular, increasing ocean temperature linked to human-induced climate change is thought to be one of the biggest threats to coral survival because it induces bleaching events. Bleaching is a process where high water temperatures cause the coral hosts to expel their algal partners. As a result, the corals turn white because the pigments from the algae are gone. An increase of just one to two degrees Celsius can trigger bleaching in some reefs. While the corals can survive for a short time without their algal counterparts, conditions can become fatal when warming is prolonged. Coral reefs worldwide experienced the worst bleaching event in recorded history in 2016 and 2017 with devastating impacts. Over 90 percent of the corals bleached in many parts of the northern Great Barrier Reef, Australia, proving fatal to about half the coral population there. Based on previous bleaching events, ecologically speaking, it takes about 10 years for a coral reef to fully recover from a severe bleaching event. However, little is known about how quickly calcification recovers after bleaching events. A handful of studies document changes during and immediately after a bleaching event, but no studies have examined long-term calcification recovery. As global ocean temperature continues to rise, bleaching events are expected to become more frequent and severe in the coming decades, making it very important to understand how this critical building block of a healthy reef system will fare in the future. Location of study site on Lizard Island, which is off the northeast coast of Australia, at the northern end of the Great Barrier Reef. 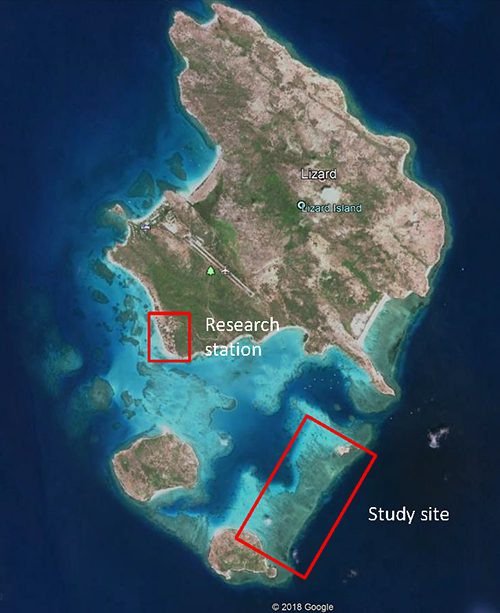 To examine the long-term impacts of bleaching on coral reef net calcification rates (the overall calcification rate that leads to reef growth), MBARI Scientist Yui Takeshita co-led a three-week collaborative field investigation in October 2018 to Lizard Island, located in the Northern Great Barrier Reef. Lizard Island experienced severe bleaching, with as much as 90 percent coral mortality in some regions. The Lizard Island Metabolism In Transition (LIMIT) expedition consisted of researchers from the California Academy of Sciences, Carnegie Institution for Science, Scripps Institution of Oceanography, Southern Cross University, and the University of Queensland. Lizard Island is one of the few places in the world where such a study can be conducted, because historical measurements provide a baseline prior to the bleaching event, and directly after the first bleaching event in 2016. 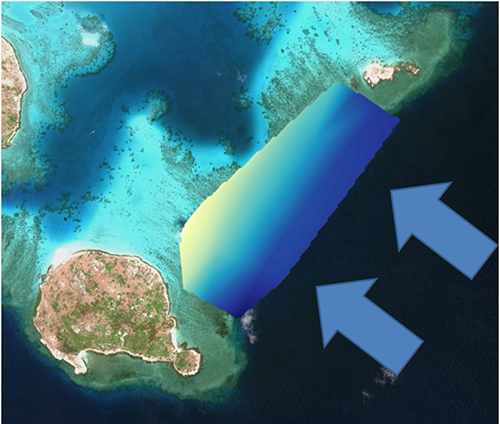 A satellite image of the study site, with a color map representing the mineral content of seawater, where blue represents high mineral content, and white represents low. A draw-down of mineral content due to skeletal growth can be seen as water flows over the reef flat. The blue arrows represent the dominant current direction. The main objective of the expedition was to repeat calcification measurements to assess the recovery trajectory of the reef, two years after the bleaching event. The team focused on a reef flat located on the southeastern part of Lizard Island, where previous studies took place. Using an approach called flow respirometry, they measured the amount of minerals in seawater that are used by corals for skeletal growth. A decrease in minerals as water flows over the reef indicates that the minerals were used for growth. Alternatively, an increase would indicate loss of skeleton through a process called dissolution. The rate of net calcification, or how fast the skeletons grow, can then be calculated by knowing how much mineral was lost, and how fast the water flowed over the reef flat. 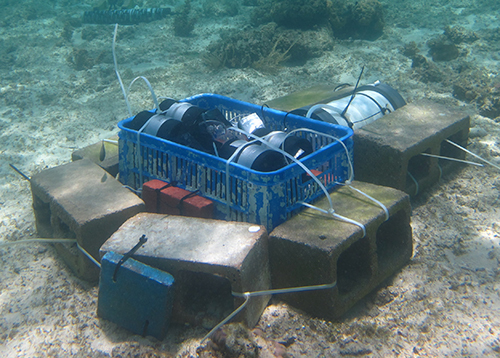 Coral reef sampling station, containing the autosampler (white cylinder) and sampling bags, housed in the blue crate. The sample crate was retrieved daily, then samples were analyzed at the research station. Photo by Yui Takeshita. The LIMIT team brought new technology to aid this endeavor. Previous studies manually collected seawater samples on the reef flat, which limited the number of samples to just a few per day. Furthermore, sampling at night was particularly challenging, and during previous studies researchers camped on an isolated island and waded out to the site to collect nighttime samples. To overcome those issues, the LIMIT team designed devices that automatically collected seawater samples every two hours into sample bags. Two of these systems were deployed on the reef flat where they collected samples day and night for approximately two weeks. Every day, Takeshita and LIMIT team members would take a small boat out to the reef flat, exchange the sample bags, and return immediately to a shore-based laboratory to analyze what was recovered by using automated chemical analyzers and techniques refined by Takeshita. The research team also conducted detailed surveys of their study habitat to document how coral cover has changed since the bleaching event. While the impacts of the bleaching events were evident, there was some good news. Among the older coral survivors, young (one-to-two-years old) coral recruits were observed throughout the reef flat. This was a hopeful sign for the reef because these new corals most likely settled after the bleaching event. Furthermore, preliminary analysis of the chemical measurements indicated that the net calcification rates are higher than in 2016 immediately after the first bleaching event, indicating active reef growth. While these signs of recovery are encouraging, it is important to keep in mind that it is still an early phase of recovery, and that the corals are still quite vulnerable to further disturbances. Mineral content of seawater measured every two hours is shown in the red dots; the black dashed line is the offshore value. Red circles below the black line represent skeletal growth, and those above represent dissolution. The high variability from day to day is apparent, highlighting the importance of making sustained measurements. The LIMIT team is scheduled to return to Lizard Island in 2019 to repeat this study to examine net calcification three years after the devastating bleaching events. This continued monitoring approach will provide unparalleled observations for coral reefs in a state of crisis. Takeshita is hoping to deploy a new chemical sensor, currently in development at MBARI, which would conduct chemical analysis in situ, removing the need to retrieve the water samples and analyze them daily on the island. If successful, this would be an enabling step towards more automated, routine assessments of coral reef health. Surveying the stability of the seafloor for the possible installation of a wind farm.